The more colors you can put in a meal, the more gold stars will be passed out by the Nutrition Genies. Why? Each color that shows up in a vegetable or fruit means there’s a corresponding anthocyanin or carotenoid (2) waiting to do its unique job in your body. The red in those luscious-looking strawberries is due to the carotenoid that has a red pigment. Carrots, of course, have an orange pigment although they can sometimes be yellow or even purple. In a plant, the carotenoid’s job is to absorb light energy from the sun (known as photosynthesis) and then to protect the chlorphyll (the green pigments from damage). They are the plant’s potent antioxidant system and they do the same in us. Even white fruits and vegetables that contain no color are full of carotenoids. One study found that people eating lots of white fruits and vegetables had a 52% lower risk of stroke. (9) and (10) Wow! I love the adage Eat a Rainbow and when I say it to my daughter she giggles and starts verbalizing her perception of tiny leprechauns munching away by their pot of gold. To her mom, I envision all those free radicals in the body being quenched by lycopene, beta-carotene and lutein (just a few types of carotenoids). Eating an array of colors provides all the antioxidants our body need to much up those free radicals that can damage DNA. So…eat a rainbow! It’s really as simple as that and one our kids will take to like bees to a flower. So what’s my motivation in creating this colorful soup? Pack in as many colors as possible. It’s a beautiful site to behold on your table and you know you’re ticking off the colorful carotenoid boxes left and right. You could really go to town with this soup and add purple potatoes, yellow carrots, red peppers, green onions…the list goes on and I encourage you to set a challenge to yourself to add as many colors as possible. By the way, make sure you add lots of turmeric. Although that bright color that can stain pretty much anything it comes in contact with makes one assume it has lots of beta-carotene, in fact, it does not. However, according to a number of studies, turmeric contains the equivalent antioxidant power of carotene, (11, 12, 13, 14) which definitely makes it a welcome addition in my soup. 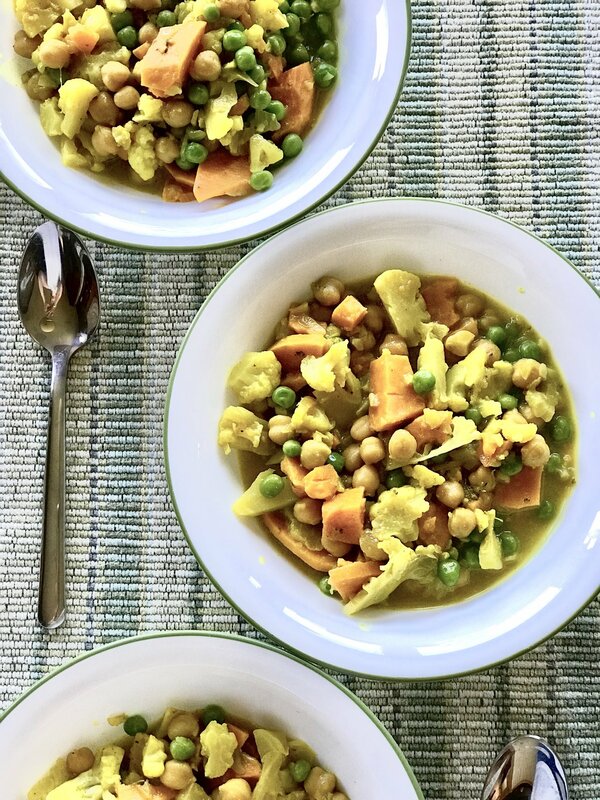 This colorfully healthy soup was adapted from Sweet Potato Cauliflower Curry from the outstanding site Minimalist Baker. There's not many people I know that don't love a curry. The problem is they probably all have a different curry in mind. There are thousands of variations. This one is vegan so it's full of lots of veggies and healthy fats and spices. However, there's not too many spices because we all want the kids to eat this one! Jam-packed with blood sugar balancing nutrition for sustained energy. Step 4 Reduce heat to medium low and add coconut milk, coconut syrup, coconut aminos, cauliflower, broccoli, chickpeas, and sea salt. Stir well. Simon, David and Chopra, Deepak. The Forty Herbs of the Chopra Center. The Chopra Center Herbal Handbook: Forty Natural Prescriptions for Perfect Health. 1. New York: Three Rivers Press, 2000, 7, pp. 55-206. ISBN: 0-609-80390-5.